Photo 1. Example of an on-farm trial. Higher yields, greater efficiency, reduced environmental impact! This may sound like a used-car dealership sales pitch, but it could represent the objectives that make an operation sustainable. Increasingly, farmers are generating on-farm research data that encompass a wide-range of practical topics. However, setting up those experiments so that the data is statistically valid is not necessarily common knowledge. The first step in setting up an on-farm trial is to choose a topic of interest. While this may seem simple, one important factor to consider is that the topic cannot be too complex. For example, a producer may be interested in how different corn hybrids react with increasing rates of fertilizer at different planting populations and planting dates. While this may sound like an interesting experiment, the complexity is simply too great for an on-farm trial. With three different options for each factor (e.g. three hybrids, three rates, etc.) there would 81 different treatment combinations in a single replication. In this case choosing one of the factors to study (i.e. plant population) would be recommended. The next step is to choose an area of a field with limited variability. To successfully do this, prior knowledge of the field is a must. Laying out an experiment in an area of a field with preexisting variability weakens the data generated from the experiment. The underlying variability could make it almost impossible to detect treatment differences if they exist. 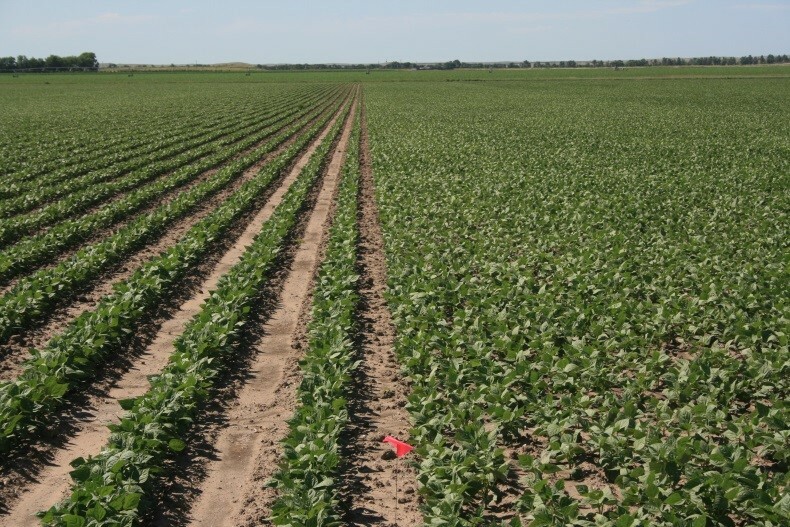 If variability in the field is not accounted for, you could end up conducting the study but not be able to tell if any yield differences were due to differences in soil type, drainage, etc., or the treatment. However, if a field has a uniform pattern (i.e. increasing productivity north to south) plot layout should account for this. Ideally, the experiment should be set up so that you can collect yield data from a relatively uniform area of the field. As discussed in the article On-farm research: Trial demonstrates importance of a good design, replication and randomization of treatments within a replication is vital. Replication and randomization help you determine if any differences you see might be due to chance, error, or variability you can’t account for. The actual experimental design will depend on the variables to be studied. University Extension personnel can help set up the experiment for you. Figure 1. Simply splitting a field in half when comparing treatments can lead to results that are influenced by underlying factors such as soil type. 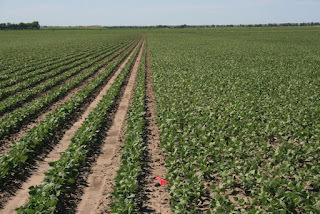 In this example, splitting the field vertically would result in one treatment being placed on soil with greater productivity potential than the other, giving an unfair advantage to this treatment. The following is a 36 acre field example taken from the Web Soil Survey. This field has two different soil types, although many fields across the North Central Region have much more variability than this. Soil type A is a fairly productive silt loam while soil type B is a much less productive silty clay loam. If the field was simply split vertically down the middle into two different treatments, the results would be very misleading. However, if treatments were laid out in replicated blocks running from left to right, the variability would be nearly equally distributed across treatments, making for a valid comparison. On-farm research can be a valuable tool for farmers. As new products and technology emerge in our ever-changing field, new questions and methods arise. Considering the current economics of production agriculture, producers are finding more value in answering questions using on-farm research methods in their own fields. Choosing a topic of interest, setting up the test on a uniform field area, and using proper experimental design and replication, are key parts of a successful on-farm experiment. Following these steps can greatly assist in generating broadly applicable data. For more information about conducting research on your farm, check out the U of MN publication How to do research on your farm or visit the Extension Crops website at https://extension.umn.edu/crop-production. This article is part two in a four-part series of articles on agricultural research and interpretation by University Extension Educators in the North Central Region.